Outlander fans, visiting Scotland, can dine out at a new show inspired by Diana Gabaldon’s bestselling books. 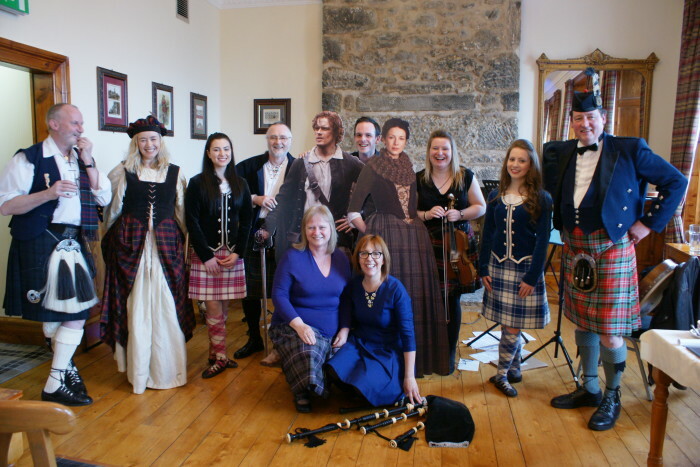 A Taste of Outlander – an immersive experience which serves up traditional Scottish food, music, song and dance, all celebrating the Jacobite period and the world of Jamie and Claire. Operated by tour company Mary’s Meanders and taking place on Thursday evenings from July until September, the show takes place at the Star & Garter Hotel in Linlithgow – a restored 18th-century inn. Alongside food inspired by the Outlander Kitchen Blog – www.outlanderkitchen.com – the evening treats guests to music and traditional Jacobite songs by West Lothian folk band Boorach, traditional Scottish dancers as well as readings from the Outlander books. Each dish is served with an explanation to its relevance to the series, and is accompanied by a quote from the book – for example, the Scotch broth served to Jamie and Claire at Castle Leoch. Mary’s Meanders is among a number of companies offering tours to Outlander filming locations, including Linlithgow Palace, Doune Castle (which doubles for Castle Leoch), Culross (Cranesmuir) and Blackness Castle (Fort William).